Cookies for breakfast? Yes, please! 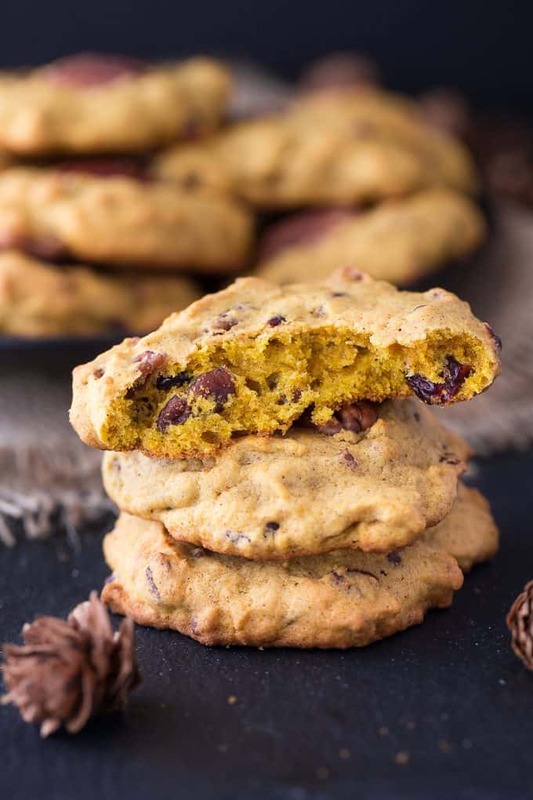 These Pumpkin Breakfast Cookies are delicious served with a piping mug of coffee or tea. 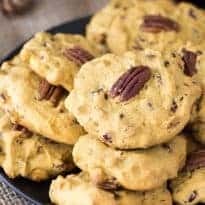 Though you could serve them for dessert, I think of them as a breakfast cookie because of their texture. They are soft and have the texture of a muffin. 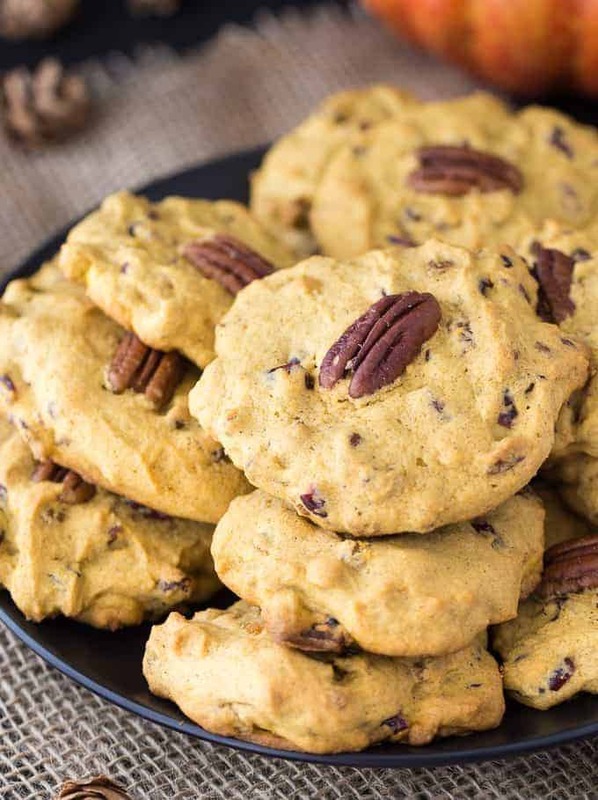 I packed them full of good stuff – pumpkin, obviously, as well as chopped pecans and dried cranberries. Raisins would work well too if you wanted to switch out the cranberries. Both have a similar texture. And talk about easy to make! You can easily whip up a batch in a matter of 20 minutes. They bake in a mere 10 to 12 minutes and come out perfectly golden. I made mine on the larger side so there’s more to enjoy. I love big cookies. Do you ever make breakfast cookies? 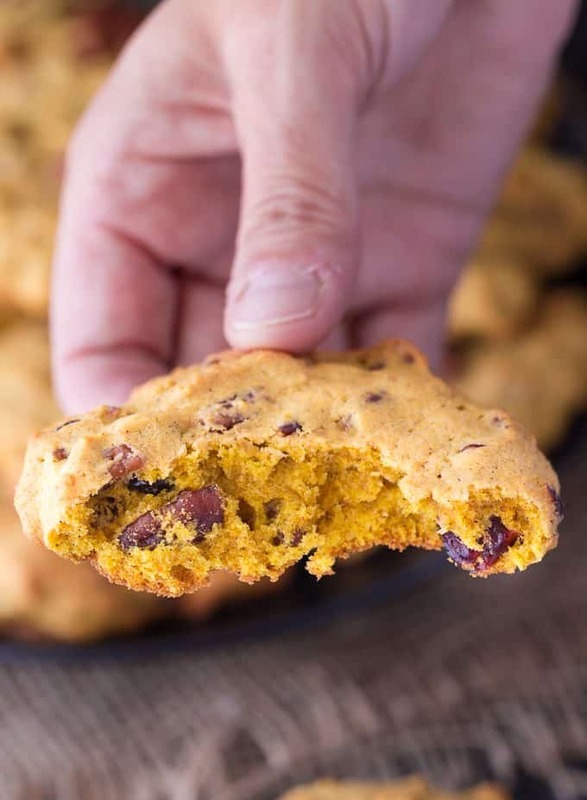 Soft, chewy and packed full of pecans, dried cranberries and pumpkin, these breakfast cookies are worth waking up for! Preheat oven to 375F. Add flour, baking powder, baking soda, salt, cinnamon and allspice into a large bowl and stir to combine. Beat butter and sugar in a large bowl on medium speed for 2 to 3 minutes. Add in pumpkin, egg and vanilla and continue to beat to combine. Slowly add in the flour, continuing to beat on low speed, until blended. Stir in chopped pecans and cranberries. Drop by tablespoonful onto an ungreased cookie sheet. Flatten cookies slightly with the back of a spoon and place a pecan half on top. Bake 10 to 12 minutes, until golden brown. Cool on a baking rack and enjoy. This looks like an awesome breakfast idea. This looks like an awesome breakfast idea.. These would be perfect for my husband, he needs something to eat on his way to work in the morning. They sound like the perfect cookie to wake up to me! Love all the ingredients! These look very interesting, but sadly I would be the only one that would be eating them, I have a bunch of picky people in my life..lol..and they don’t know whats good for them!! would love to give them a try though!! 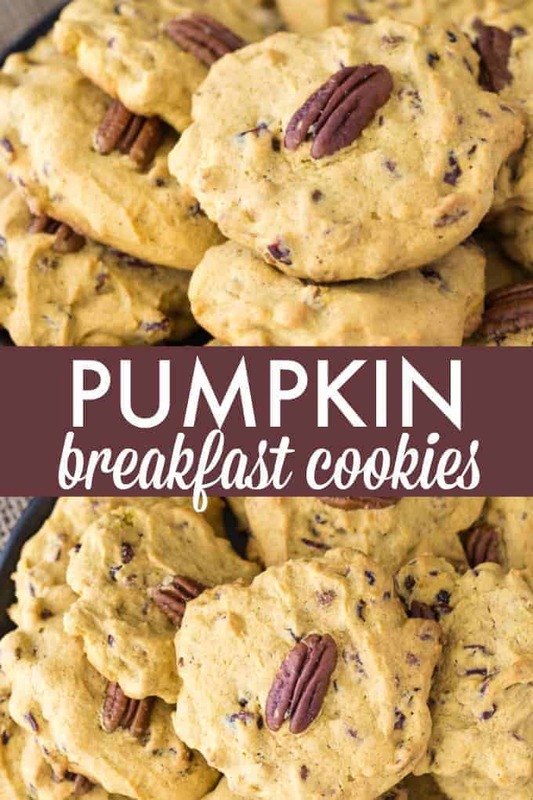 I most definitely would love to try the Pumpkin Breakfast Cookies. I think it is a fine treat, of which I am going to try for this coming holiday on the 31st. I like all the ingredients and think it would make a great breakfast with a glass of milk. These look really delicious as I love everything pumpkin. I would probably add chocolate chips to these and delete the nuts as I am allergic but want to try these. Thanks for sharing the recipe. I love the fall and all the pumpkin flavored recipes and drinks that come out, this looks good! The Pumpkin Breakfast Cookies are so pretty! I really like how delicious they look and want to make these! Thanks for sharing this recipe! These look and sound so yummy. 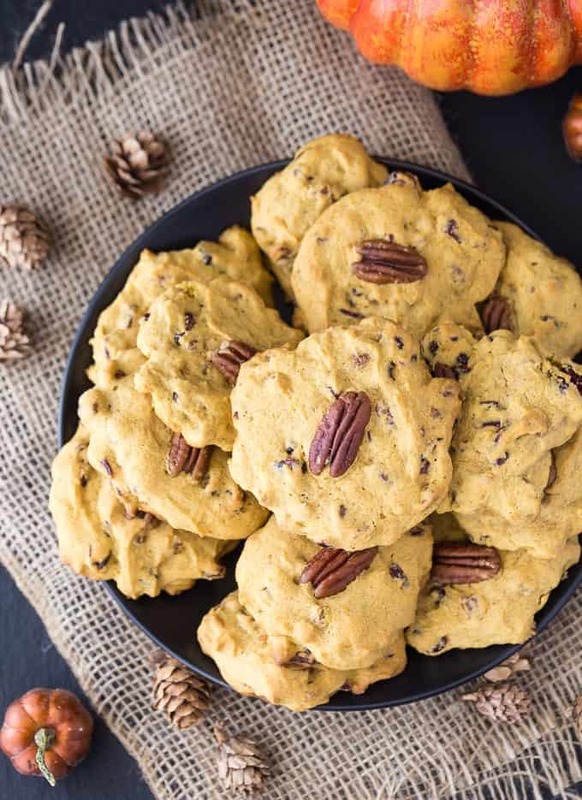 We love pumpkin and pecan during the fall or anytime of the year really. I will be trying these at home for my family soon. Cookies for breakfast? I’m in! What a great way to wake up in the morning! These cookies sound really good! and these would be great to pack on the go breakfast. These look tasty! My boys love everything pumpkin! Cookie for Breakfast are never a bad thing! These cookies look great and cookies for breakfast are my kind of food. Oh my, these have “perfect breakfast to throw in my tote when I’m eating on the way to Bible study” written all over them! 😉 I. Want. Stopping by from This Is How We Roll! 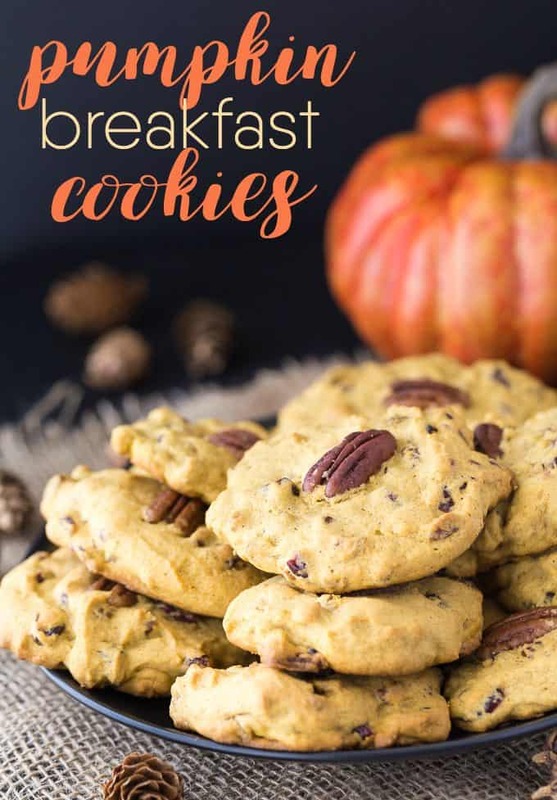 I love breakfast cookies – and these look so special, I’m excited to try them! I have some leftover pumpkin puree in my freezer; I think I know what I’ll do with it 😉 Thanks for linking up with our Merry Monday party!